" Grammy Award Winning Reggae Singer-songwriter. " 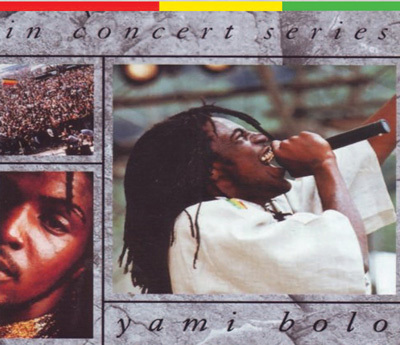 International star Yami Bolo has been recording and performing "Jah-centered" cultural reggae since the 1980s. Bolo believes that he has been divinely called to make himself and his entourage revolutionary soldiers of the Almighty on a mission to spread their message of love, peace and hope to the entire world with their performances and recordings. He is particularly interested in uplifting the youth songs that warn against violence such as "Gun War." Born Rolando McLean, Yami Bolo's earliest musical influence was church music; he began performing at age 11. He got his big chance when he hooked up with Sugar Minott and his Youth Promotion organization. Minott was impressed by Bolo's sincerity and eventually allowed him to record special promotions for traveling DJs — none of the many tracks he recorded with Minott were ever released. While associated with Minott, the adolescent Bolo would spend much time hanging out at Jamaican studio listening to roots beats and learning about recording. Later, Bolo performed with Stur-Mas and Third World. As an independent artist, Bolo signed with Techniques in the mid-'80s and released three singles. He then went on to cut one LP with Junior Delgado and another with Augustus Pablo before recording the solo CD He Who Feels it Knows It for Heartbeat in 1989. In the early '90s, he was signed with Taxi Records and also to Paisley Park Records as a songwriter. Throughout the duration of the nineties Bolo recorded for the RAS and VP labels, as well as issuing 1991's He Who Knows It Feels It and 1992's Up Life Street on Heartbeat. Yami Bolo, called "the freshest Roots and Culture artiste springing out of the pack in Jamaica today "has torn up crowds as far away as Canada, Japan, Europe and the United States and is not stopping. Yami Bolo's magical voice speaks directly to the heart, his singing style has been passionately compared to "a cry out in the wilderness" inspiring strength, joy and hope. Born Rolando Ephraim McLean on October 1, 1970, raised in Kingston 13, Bolo became exposed to music at an early age through the church, which his grandmother always insisted that he attend. His early attraction to music was further encouraged by his grand mother's gift of an accordion and a trombone. Yami Bolo's first professional training in the music industry occurred while he was a member of Sugar Minott's Youth Promotion Crew of the 1980's, which was instrumental in the careers of such great singers as Garnett Silk and Tenor Saw, among others. Yami Bolo's first major stage show was at the St. Andrew Technical High School, where at the tender age of 13, he performed his emotional hit single "When A Man's in Love" still a favorite in the dance clubs today, and from which KRS-1 sampled his hit "Take It Easy." Since that time, Bolo's musical career has led him on a series of regal adventures. He has worked with top producers including Augustus Pablo, Coxson Dodd, Lee Perry, Winston Riley, Clive Hunt, Sly and Robbie, among others. In 1987, at the age of 17, he was invited on tour with Augustus Pablo's prestigious Rockers crew and in 1994 created an indelible impression on the Japan Splash tour leading to a unique collaboration between established Japanese superstar, Kazafumi Miyazawa (Miya). The "Miya-Yami Project" garnered the "Best Music Video '94" title in Japan making Bolo the proud recipient of Sony's Silver Grand Prix Award and their album "Love Is Dangerous" became one of the best selling reggae albums in Japan with sales topping in excess of 500,000 copies. The single "Brothers Unite" was voted Best Reggae Single 1994. Bolo remains true to the spirit of reggae when, in speaking of his work, he states "the singer is but the instrument. It's the Almighty at work." Yami Bolo's commitment to conscious lyrics is evident throughout his music, he is determined to spread the love and happiness of his spiritual strength through exploring his multiple roles as singer, songwriter and musician. This is exemplified on Yami Bolo's over nineteen albums. Yami Bolo recently appeared in the movie "Life and Debt" and his single "Worldwide Corruption" is featured on the soundtrack released by Tuff Gong/Universal. Yami BoloYami Bolo's talent has been long recognized by fellow artists, recent collaborations with Ghetto Youths Damian and Stephen Marley include the No 1 Jamaica-hit single "Still Searchin;" "She Needs My Love;" and "Stand A Chance" for the Motown-released Grammy Award-winning "Halfway Tree" album. Collaborations with Capelton "Put Down the Weapons"; Jack Radics "The Puppet Master"; Josey Wales and Charlie Chaplin "Do Good" exemplify Bolo's militant commitment to the youths whose "coming of age" under current economic and social conditions require the love of their fellowman and a redefined reverence for the highest moral standards, have lead to popular radio hits in Jamaica. "Freedom" co-written by Yami Bolo and Snow was produced by Dave Kelly for Atlantic Records. A collaboration with Wyclef Jean “The Eulogy” and vocals for “Three Nights In Rio” Mad Lion on Yami Bolo's original "Take It Easy" will soon be released. Yami also produced the Firewalker rhythm track on Kymani Marley's Grammy-nominated album "Many More Roads." "Jah Made Them All," "Jah Jah Give Me True Love" and "Be Still Babylon" are anthems which embody Bolo's love for the Creator and his devotion to Jah Rastafari. Bolo's adaptation of Madonna's "La Isle Bonita" transformed the song to subtly celebrate Jamaica's own beauty and romantic vision, another favorite of Jamaica's radio waves. Yami Bolo has written three soundtrack songs for CTW's Sesame Street and Cartoon Network's "Big Bag." he also wrote an perform on the sound track for film (Our Song). "Exclusive Albums, Singles, Compilations, Features, Duets, Unplugs"
"Wallpaper, Ringtones, Exclusive Videos and more"
"Twitter, Facebook, Instagram, Youtube feeds"
"Official Yami Bolo Music & Merchandises"